Marketing ideas to increase your small business sales for very low investment cost. Increase your sales with small business marketing tips on communicating with your prospects and customers. Learn small business marketing ideas on how you can easily use modern technology to grow your business. Don’t let your business go the way of the dinosaurs. Keep up with the latest developments in small business sales and marketing techniques because your competitors will. This section of the site is aimed at the marketing ideas to increase your sales, not the technology. Start with how you want to target your market, and then look for the technology. Don't make the mistake of spending money on some whizzy bit of kit that looks good and then trying to find a use for it. Many people don't know where to start with all the new marketing methods now available. Here you'll find simple guides, with links to examples from the company I use to promote my business online. The electronic and web based marketing ideas can be simple to use to grow your small business. ...I built and maintain this website, and I've had no IT or computer training. I don't pay anyone else to maintain it, no consultants, no web builders, I simply type and click and the information is online. The best technology is always the simplest and easiest to use. The links on this page show you some of the tools I've been able to use..
Take a look at how easy it is by opening How to build a small business website that works and see how easy, and cost effective it is.. The links in this section of the site take you to examples of the tools avialable to you, and show you how others have used them successfuly. Take a look at the small business marketing ideas and click around the examples. Providing knowledge and infomation to your customers and prospects is the modern way to market your small business. Many salespeople will hesitate before providing information to a prospect that currently buys from thier competitor. One of my small business marketing tips to you, provide your prospects with information and use it as a reason for regular contact. You can see the theory behind this small business marketing idea od giving good information and content to prospects by opening the C-T-P-M small business online marketing method. Giving this service, of content or information first, to a prospect builds a relationship. It proves your sincerity and builds confidence. You are making a gift which may be recipricated. Imagine how you would feel if you discovered one of your loyal customers was in regular contact, by the web, email, newsletter, text, or Bolg page, with a competing firm. That's how your competitors will feel when you invest in regular contact with their customers. You are sending a message that says, look at what we are giving you, and you're not even a customer yet. A really effective marketing idea is to become a source of information in your marketplace. When people come to you for information, buying from you is only a short next step. If you don't build a two-way comunication with your customers and prospects, someone else will. Email has been around a long time now. It's here to stay and you can use it for some great small business marketing ideas. Even in it's basic form email is a great tool for fast two-way communication, and for sending marketing ideas and information. You can use it to send information to targetted individuals or mass mailing lists. ...I can remember when people couldn't send email and some thought they never would ...now some people view other new technology the same way..
A great sales and marketing tip is to make use of email. It's cost effective, has a modern image, and is quicker than letter. Customers can reply instantly, images can be sent and received, and you can now pick up your email on the move. Do you use it to its full potential? On the left of this page, below the navigation bar, is a box for visitors to leave their email address so they can get my free sales training newsletter. It's sent by email to the hundreds of visitors that have entered their email address in the box on the left. The receiver gets up to date small business sales and marketing ideas, and I get regular contact with the visitors to this site. This free information leads to people recommending my site to others, emailing me sales questions, returning to the site regularly, and buying some of the sales products in the Site Shop. The newsletter I send comes free with the website package from SBI. You can see some of the back issues of my newsletter and decide if you should be sending out a free newsletter by email to your prospects and customers. 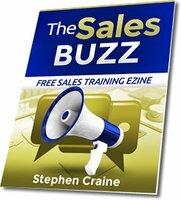 Click the link and see The Sales Buzz Newsletter back issues. If you like what you see enter your email address in the box on the left and get yours delivered free to your inbox. For more information on the free sales newsletter click the link or the image. Text messages have their place as a small business marketing idea. Dentists and doctors use them to remind patients they have an appointment. 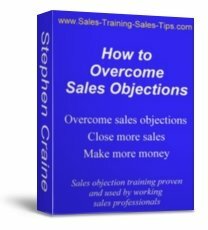 Is there a place for them in your sales operation? Consider using text to remind sales prospects of appoinments. Promising to text a reminder also gets you the buyer's mobile number. Use the reminder text to prompt them to bring the information required for the sales meeting. Sales managers can also get sales info by text. It's a quick and easy way to communicate up to date figures if you dont have a live company CRM system. Many of the marketing ideas you read here, about contact with customers, can be adapted for communicating with your sales teams. They respond to regular contact and information just the same as customers. Mobile phone companies make good use of text messages. They use them to market new priducts and services, highlight new offers, and keep regular contact with their customers. It isn't right for every small business sales operation. But consider how you might be able to use text messaging. Would it be a good way of sending reminders, or personal messagaes that you've completed agreed actions for customers. What about updates to your product or service range, or the launch of a new product. Think about this marketing idea and if it fits into your sales and marketing plan. Some companies have not caught on yet. The greatest marketing idea and sales tip I can offer you in this section of the website is: the Internet is here to stay, and it will grow in its importance related to selling. Some people are still hiding their head in the sand and think the WWW will eventually go out of fashion. It will not. It will grow, develop, and evolve, and it's importance to small business sales and marketing will increase. There are still many websites out there that have no purpose other than being a website. They are almost like an old fashioned billboard advert on a high street. Unless you know how the website game is played no one will see your advert on the web. Websites have to have a purpose, a marketing idea, a target, or a theme. They must be built to fulfill a purpose. Whether it's to sell, promote, market, or supply information. There is a marketing plan that small businesses and self employed people can follow to get the most out of the Internet. By following a a step by step guid that many others have followed to find sucess, including me, you can have that same success. Here is the 10 step action plan from SBI, the company I use for my website. Whether you decide to use SBI or not for your website, you can still use their action plan as a marketing idea for your small business. Open the SBI 10 day action plan and see how easy it is to get started. No matter how small your business you will benefit from a web presence. From a one woman or man, self employed, small business to a medium size organsation can increase and grow using online marketing ideas. If you haven't got a website, or the one you have is not bringing you business, I've found something that will be great news for you. There are many ways you can market your small business on the Internet. From a simple one page website that you write yourself, to a multi site presence that you pay a web marketing company to build and maintain. Here's an example of how some people have built their own websites for little cost, and the small business marketing tips they can offer to you. Open the page and click on the images to see their marketing ideas and sucesses at Marketing ideas for small businesses. New opportunities are opening up. Different types of blogs, RSS feeds, social networking sites. All becoming as popular as the usual internet websites. Are you using them to support your small business marketing ideas? List all your marketing ideas, and sales objectives, and then match them with the technology that can best support them. Here's a basic guide to Blogging. One of the fastest growing ways of marketing a small business online. I currently get as many visitors from my web blog as I do directly on to my website. Many people only know blogs in the form of a daily diary. An update from someone with an interesting life ...or at least they think it's interesting.. This is one form of blog. It may have only limited use for businesses, and it's very time consuming. You have to update it daily and if you run a website and a blog independently it becomes a chore. The marketing idea I use is: Blogs don't have to be updated daily or independently. 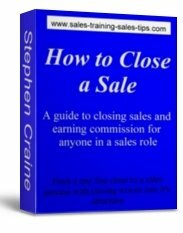 Have a look at my blog, which you can get for free, by opening the Sales Training Blog for this site in a new window. I am a salesman ...I'm not missing an opportunity like this to promote my own blog ...did I tell you it's free. My own blog is updated every time something new is added to the site. So visitors can access the information from the website, or use the blog. I'm giving the visitors a choice, and I'm really pleased with the Blog results. With the web host I use I don't even have to write the blog. The content is taken automatically from my site updates. What a fantastic marketing idea that is, and worth the price of the website alone. I write one page and it goes onto my website and into my blog. If I want to add more to my blog without adding a new page I can. I can link what I add to any page on the Internet. If something interesting to sales people comes up on a news site I can add it to my blog. My customers and prospects get free information and I get credibility as a professional in my field. See how easy it is to have your own blog. Click on the orange RSS button on the left, below the navigation bar, and subscribe to my free blog to see how it works. If you've never blogged before click the ? next to the orange RSS button for more information. If that box looks complicated to add to a website I do it with one click of a button. The rest is done for me for no extra cost. If you haven't got a website that is making a major contribution to your sales, or your thinking of starting a new sales operation, take the tour and get the small business marketing idea at the quick tour slide show. RSS is a way of delivering and distributing content. RSS isn't the content itself, it's simply the distribution method for electronic content such as blogs, news sites, and publishers. RSS is used by people who regularly use the web. It allows them to stay informed by retrieving the latest content from the sites they are interested in. It can save time by not needing to visit each site individually. To read an RSS feed you can use Readers and News Aggregators. They also ensure their privacy because they do not need to join each site's email newsletter. The number of sites offering RSS feeds is growing rapidly and includes big names like Yahoo News. My Yahoo, Bloglines, and Google Reader are popular web-based feed readers. Ask a question, make a comment, share your small business marketing ideas and tips. You can even add some information about you, your business, and add a link to your website or contact information when you send us your comments. A great advert for the visitors to this site that might want your services. Simply open learn and share sales skills page scroll to the comments box then type and click. It's that easy. To go to the home page and start a new search for more sales and marketing training and ideas open Sales Training home page and click around the site.